Hey, readers. I did it. 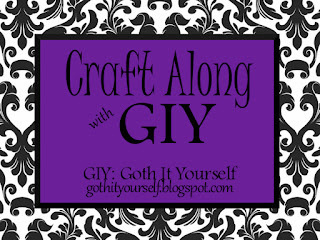 I threw my hat in the ring, and took part in Craft Along with GIY. The theme for this month is letters and numbers. After 2 years of it sitting amongst my craft supplies, I finally made use of my letter A pendant. Since I was out of silver chains and limited on silver wire, I had no idea how I was going to turn this thing into a necklace. After a lot of overthinking and checking out necklace designs online, I decided to make it out of beads and eye pins. Normally, I only used eye pins for earrings and small necklace details. However, I put my paranoid fears aside and went for it. Voila! Craft Along with GIY Project: Complete. Til next time. Hey, readers. Blogger's block has set in again. I've been spending most of my time lurking online, getting nit-picky with my outfit customizing on second life, and trying to think up a new jewelry making project for this month's Craft Along with GIY theme. All and all, the past couple of weeks have been uninteresting. Before I end this post, I would like to pose a question to you all. What do you think about these kind of blog posts? Ones where I just talk about myself and what I'm up to. I try to keep posts like these to a minimum because I feel like people aren't really interested in them. In my opinion, posts like these are a nice break from the pressure of trying to post about only goth/alternative things. Let me know in the comments. Til next time. Hey, readers. In my last post, I talked about and showed off a jewelry set that I had recently made. Late last night, I took a look at the necklace from it and realized that I wasn't that crazy about the placement of the bead work. So, I took the necklace apart and changed the placement of it. Here's what the necklace use to look like. I removed 2 of the split rings that I used to attach the first chain to the key pendant and just ran the chain through it. Next, I added the bead work to the chain ends. Then, I reattached the second chain. Since, I could easily put the necklace on by pulling it over my head, I removed the toggle clasp. This simple design fix makes the piece look so much better. Today, I was in another jewelry creating mood. So, I decided to make some more earrings. Another productive day in the bin. How's your week been going so far? Let me know in the comments. Til next time.